All boats to be scrutineered and are to be completed before the event. Please note SRA Gate 3 scrutineering is required for all boats if you have competed in any SRA sanctioned event prior to the 28th January 2019. Contact your local SRA scrutineer on or after this date for this and get it done at a time that suits both parties. There is no scrutineering available on Friday at the Moama Water Sports Club Offices or in Echuca. Make sure your scrutineering sheet is sent thru to SRA office prior to race weekend. All boats with cable and pulley system steering to have their cable replaced for Gate 3. Old cable to be presented to scrutineer. SRA rule 9.14x. All V Drive boats to have a new prop and rudder crack test as per SRA scrutineering sheet to be done on or after 28/1/19. These also need to be sent through to SRA office prior to race weekend. This is a Roads and Maritime and SRA requirement for conditions of Aquatic Licence. THERE ARE NO EXCEPTIONS TO THIS CONDITION OF ENTRY. All competitors are requested to provide their SRA picture id Membership Card when signing in when being breath tested and for briefing. Signing in will be via the bar code on your SRA membership card. All skiers are to present their helmets to the breath testing area for checking. The entries for the event are now CLOSED. Entry fee, includes the costs to run the event including SRA sanctioning, Ambulance, administration costs, trophies etc. Note there is a 1.5% transaction fee for the use of Credit Card. This will be charged at the completion of the transaction. It is recommended that at least one Telstra mobile phone be carried in the boat, as this service has been found to provide the best coverage in this area, in the case of an emergency. Please ensure that this number is noted against the driver or observer in the event, in the case that we need to contact you urgently. Driver and Observer phone numbers as per SRA membership come up on Racesafe screen at Race Control. This event will be timed utilizing the Race Safe H20 Unit, please ensure that it is fitted correctly. If we are unable to read your unit, you will not receive a time for the event and will be disqualified if unit is not correctly fitted. ANY BREACH OF MWSC BYLAWS OR OUR AQUATIC PERMIT WILL LEAD TO PENALTIES / DISQUALIFICATION AS PER THE DISCRETION OF THE CHIEF JUDGE IN CONSULTATION WITH MWSC OFFICIALS. DECISIONS ARE FINAL, AND WILL BE ACCEPTED BY ALL TEAM MEMBERS AS PER ENTRY FORM. The Southern 80 Ski Race is conducted under Ski Racing Australia Rules (“SRA”) , Moama Water Sports Club (“MWSC”) Bylaws and Aquatic permit conditions from RMS NSW. All competitors will be conversant with all such RULES and BYLAWS. The MWSC reserves the right to refuse entry to any Competitor at any time prior to commencement of their race. By entering this event the competitor acknowledges that Ski Racing is a dangerous sport in which there is an inherent and significant risks that physical injury, including serious and permanent disability and incapacity and even death (injury) may occur. RaceSafe H20 refund given if notification is given in writing prior to the 1st February 2019. SRA Boat Race Day Fee refund given if notification is given in writing prior to Friday 8th February 2019. All refunds will incur a $30 admin fee and will be processed to the team captain within two weeks after the conclusion of the event. All Competitors must have current SRA approved State Ski Racing License and Maritime License (or state equivalent). All boats must carry Maritime Safety Equipment. Drivers, Observers and Skiers must wear approved life jackets and helmets. We will be contacting team captains via email and SMS before and during the event, please ensure that these details are correct with Ski Racing Australia. MWSC will not be responsible for any delays or cancellation of the event caused by a force majeure event including but not limited to acts of God, fire, war, terrorism, epidemic, earthquake, strike, bad weather, labor controversy, order of court, shortage or interruptions of facilities or material supply. Competitors will obey directions from all Officials as per SRA Rules Code of Conduct. All competitors will be conversant with MWSC Briefing Sheet regulations regarding withdrawals, injuries and recovery of stricken boats. Breaches of these rules may incur disqualification from future MWSC races. All Competitors must attend breath testing prior to every race. i.e. ; if you are racing Sunday morning & Sunday afternoon you must be breath tested twice Sunday prior to each race. Random drug testing will be carried out. Alcohol is not permitted to be carried in boats. Consumption of Alcohol is not permitted by Competitors until Boat and Crew are all out of the water. Breach of this rule may incur disqualification from future MWSC races. No refueling in the water at any time. No pulling of drain plugs when on ramps. They will be emailed to Team Captains, after 21st January 2019, please ensure your details are correct with SRA. Scrutineering of boats Post-Race will be carried out in both Inboard and Outboard classes. All engines will be checked, when requested by Chief Scrutineer with two sober team members only. Refer also to SRA 11.11 Failure to comply will incur immediate disqualification. Skis used in social classes must conform to SRA rule 8.7 Ropes in Social Classes at the Southern 80 to be MAX 75m including tracer and handles. Superclass entrants must have applied to SRA to compete in Superclass as per SRA rule 8.10a. A completed entry must be submitted and a second class nominated. Bakers Blitz and Presidents Dash, all these boats will run Saturday for position on Sunday, you must supply their own Blitz and Dash number, Blitz will be Super Class boats, Dash will be next fastest boats as seeded by the SRA seeding committee and will be advised by MWSC after 10/1/19. Sunday number will be provided by MWSC. All substitutions are to be in writing via email. No substitutions will take place during the Race (no swapping positions), breach of this rule will incur disqualification. Under 10’s Class to tow ONE skier Disabled Class to tow ONE skier unless prior arrangement with race committee. Failure to complete race day reports within 1 hour from completion of racing will see time/result not being posted. Please comply. Any breach of MWSC Conditions of Entry will lead to Penalties/Disqualification as per the discretion of the Chief Judge in consultation with MWSC officials. Decisions are final and will be accepted by all members as indicated on the entry form. If you are out Training for the Southern 80, please be aware that you are on the water under Normal NSW Roads & Maritime regulations. All safety equipment must be carried in your vessel (e.g. bailing bucket, no bow riding etc). You must adhere to and OBEY all Maritime speed and No Wash zones. You must not be on the water before Official Sunrise. We strongly recommend that no one is on the water before 7.00am and not upstream of 5 mile before 7am as you are in the township of Moama soon after and we are struggling to fend off complaints. Do not ski through wills bend. Also remember the river is OPEN to all at these times, you must stay on your side of the river! We also recommend that no one train traveling downstream before 8.30am. Failure to follow these guidelines, can see the MWSC committee withdraw your entry from this year’s Southern 80 with no refund. This clause does not apply to a vessel operated in accordance with an aquatic licence. Just as a reminder – we apply for exception to this rule under our Aquatic Licence. If you practice outside the rule, we may not be granted an Aquatic Licence. 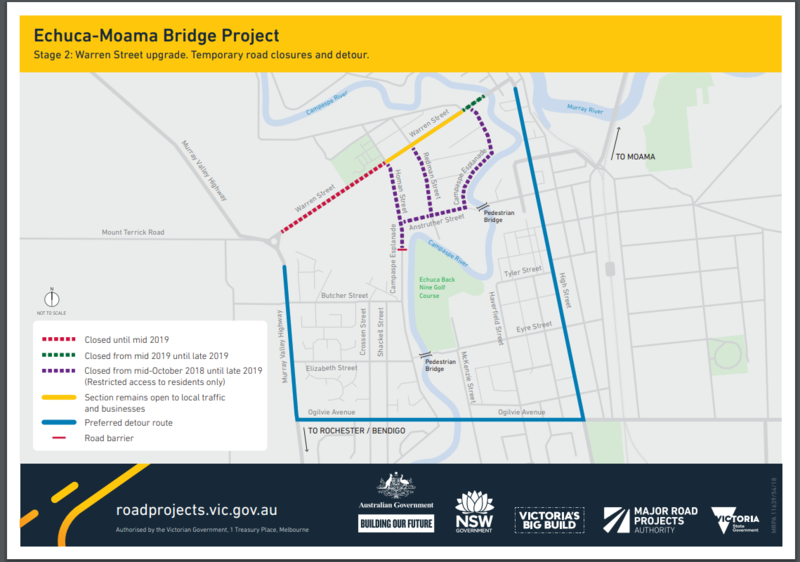 With the new bridge coming Warren St, the road used from High st to Murray Valley highway, will be totally closed and all the roads around Warren St. This means all traffic will have to go through the KFC intersection. Please allow one additional hour to get to and from Torrumbarry. Please take this into account if you wish to do double runs Sunday morning or afternoon. There will be no holds or priority passes for launching boats at Torrumbarry. Due to the road works teams are requested not to stop part way back to Finish line to watch your team come through as you will not be at finish line in time to retrieve boat when it completes course. We apologies for an inconvenience but this is out of control of the MWSC and will only impact the race for 2019.